FROM “NO DEAL” TO CLEARED-TO-CLOSE IN 9 BUSINESS DAYS! Shannon and Lee were referred to me by their real estate broker after being told by their previous lender that he could no longer get them approved for their mortgage more than a week after he told them they were fully pre-approved to buy this property. Since they were already under contract and closing within 30 days, they called me in a panic. Not only was I able to get them approved for their mortgage with less money down, cheaper mortgage insurance, AND at a lower interest rate, but I was also able to get their loan cleared-to-close in only 9 business days! This couldn’t have happened to a nicer young couple. 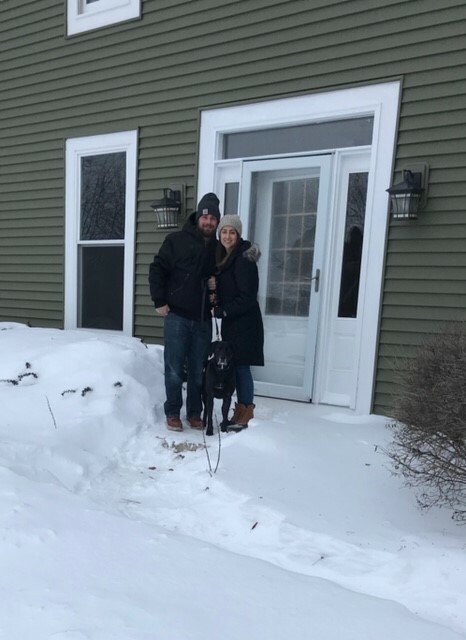 They were absolutely thrilled at their closing, and they even agreed to send me a picture of them standing in front of their beautiful new home….in the negative 20 degree windchills! Thank you Shannon and Lee! Special thank you to their outstanding real estate broker, Beth Kautz from Century 21 Roberts and Andrews, and also to their fantastic real estate attorney, Michael Domanico.